I have wrestled with trying to understand injustice from an early age. Growing up, learning about the persecution of Jews made no sense to me. I questioned how people who did not know me could hate me and want to do me harm simply because I was born a Jew. I knew I was a good person; I knew my people were good people. For me this not only produced feelings of fear, but it also made me wonder if this could be true for all groups of people. What if the “other” — whom I was sometimes encouraged to fear or judge — is also good? What if false judgments, lack of knowledge, and misinformation is an excuse for hatred? Professional Background Judith Serebrin’s book art and sculptures have been widely collected and exhibited internationally by libraries, museums, and individuals, and have been featured in books about artist’s books and contemporary ceramics. 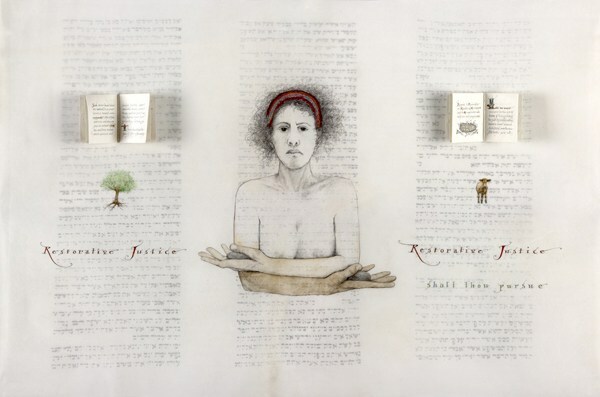 She is a member of a Jewish/Palestinian Living Room Dialogue and teaches at the San Francisco Center for the Book.